NEW kid on the block Phoenix has just tapped the services of veteran big man Paolo Bugia - not as back-up player but team manager of the rookie franchise. 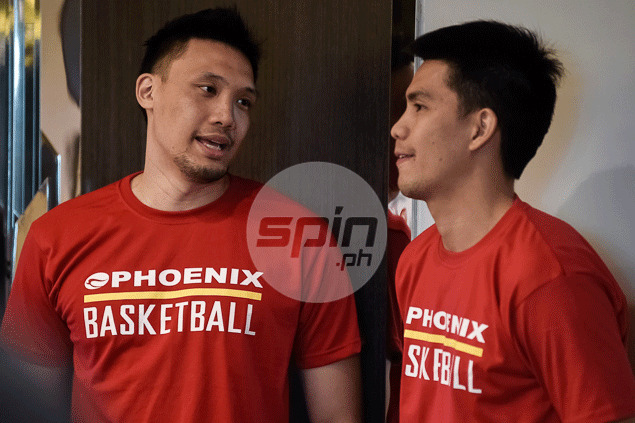 The 6-foot-6 Atenean already decided to trade his playing jerseys for the corporate suite as he begins what he considers a ‘new chapter’ in his life. And Bugia’s first official function as team manager came when he was formally presented as part of the Fuel Masters’ management team when Phoenix was formally launched last week prior to the start of the PBA Commissioner’s Cup. Phoenix brought the Barako Bull franchise lock, stock, and barrel. The 35-year-old Bugia said his retirement from the game he dearly loves came so abrupt, but made it clear he has no regret taking on a new career path. “I wasn’t ready to retire and my contract expired last August (with Alaska). Unfortunately, I was out of the loop at that point, so I told myself, I played 10 years in the league, so maybe I should try other aspects. Maybe there’s something there for me,” recalled Bugia of the events that eventually led to him giving up his playing career. Bugia belongs to a rare breed of basketball players who not only holds a degree, but also owns a master in business administration. His determination to finish his studies – and more – was obviously a preparation for life after basketball. “I always saw myself being in the corporate (world) after basketball, that’s why nag-pursige akong tapusin yung pag-aaral ko,” he said. The wisdom of no less than Alaska team owner Wilfred Uytengsu helped him decide to pursue a job in the corporate world. “Boss Fred (Uytengsu) is really very classy and professional. He told me corporate is a life I should move into. That kind of motivated me to move on faster away from basketball and start new things,” said Bugia. He did submit his resume to Alaska, and also to San Miguel Corp., and some other companies, mostly involved in the pro league. “I went through interviews, I went through a panel of interviews. I did test, I went through profiling, and all that stuff,” said the 17th overall pick (second round, Barako Bull) of the 2005 Draft. But it’s with Phoenix that he found himself suitable for the job as it involved both basketball and corporate works. “Luckily and fortunately somehow, I landed at Phoenix. Sakto lang they were looking for sports personnel because they are moving in the PBA, and I have my background because I played in the league for 10 years,” said Bugia, who averaged 3.3 points and 2.2 rebounds in 193 games played suiting up for Barako Bull, Purefoods, and Alaska. Does he miss playing? Bugia was asked. “I do (miss playing). Minsan I join them (Fuel Masters) in practice not because I want to play. More on recreation na lang,” he said.